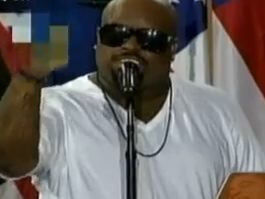 Singer Cee Lo Green performs his hit tune "F**k You" at an Obama fundraiser in Atlanta on Friday. He uses the explicit lyrics before he uses the radio-friendly "Forget You" lyrics. President Obama speaks shortly after his performance. Brit Hume: "Romney Is Winning And He Is Winning Pretty Big"
Barbour: Contested GOP Convention "Not Necessarily Bad"